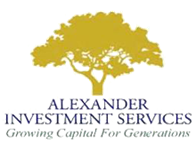 At Alexander, your financial needs are paramount. We embrace our obligation to make suitable investments our primary concern. To that end, we seek to provide you with the best of the best, whether mutual funds, exchange-traded funds, or other financial vehicles. We carefully and routinely vet investment managers in pursuit of superior performance at reduced risk. In addition, you may be secure in the knowledge that you are doing business with a reputable firm since our founding in 1965. (Find out at www.finra.org/brokercheck! And while you're there, please have a look at your current broker or investment firm!) Finally, you keep more money in your pocket due to our affordable rates.